Ama is a historical fiction that narrates on the transatlantic slave trade, following the coming of age of a young girl from her village where she is kidnapped and raped, to Brazil. Ama, her first name is Nandzi. She is captured when she is taking care of her brother alone in her village, sold into the Ashanti Empire, fell in love with the king and re-sold again. Turned into a sexual companion to one of the old Dutch, against her will, though it kept her away from the dungeon. One situation led to another, she found herself sailing in the ship The Love of Liberty on her way to be sold again in Barbados for the 3rd or 4th time. they are deprived of human qualities in the most horrendous way ever. How they are cast into the violent waters at the minimum stir of rebellion or sign of illness. As the story progresses, instead of Barbados, they landed in Brazil where human beings whose skin colour were different shades of black were treated like livestock or worse. This is a heartrending read with a high content of anguish and realising that it is part of our history, the Human History, even makes the feeling worse. I guess that is the reason why I have been procrastinating. Reading Ama's story and knowing that there are many more stories to be told of this inhumanity makes it a reading experience that evokes different layers of sadness. This is a novel very well written and researched that deserves all the accolades. I highly recommend. Ama is the winner of 2002 Commonwealth Writers' Prize: Best First Book, Africa and Overall. Therefore, part of my Commonwealth Writers Prize for Africa Region Winners Reading Challenge. 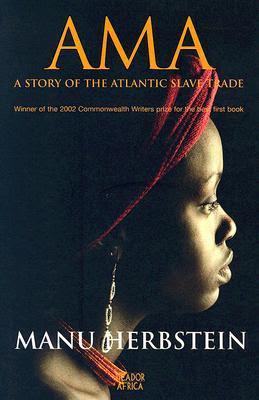 Another African literature that narrates on the transatlantic slave trade is Cry a Whisper by Lucy Safo winner of 1994 Commonwealth Writers' Prize: First Book Africa. I think it won an award for its depth in research. Do you know the name of the award? Have you read Yaa Gyasi's "Homegoing"? I wonder how you feel the two books compare? not yet.. I am reading "The Book of Negroes" by Lawrence Hill. I look forward to reading Homegoing by Yaa Gyasi. Have you read them? Nice review! I read Homegoing in July and it was an amazing account from a Ghanaian-American perspective. I actually just posted a review on it. I need to purchase Ama soon! Just so I can compare and get a different perspective on the transatlantic slave trade through another historical novel! I have not read Homegoing yet, everyone seems to love it... I look forward to reading it though. Ama is an intense read.. I highly recommend.. at the moment I am reading The Book of Negroes.... it is also a somewhat different perspective on the transatlantic slave trade..... very entertaining.